David Pollack is a big personality, with a smile and personality that just won't quit. 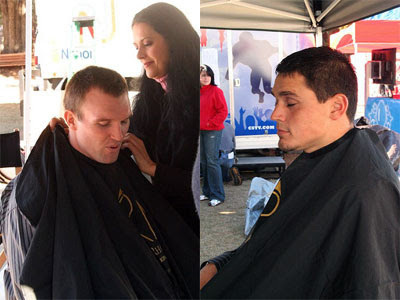 For the past two years, he has been a fixture on the CBS College Sports Network, fashioning a new career after a career-ending neck injury with the Cincinnati Bengals. Now with the new Southeastern Conference television contract, Pollack will be moving over to ESPNU for multiple assignments. And he will not be lonely. Former Georgia two-time All-American and Oakland Raider/Tampa Bay Buc Matt Stinchcomb, who joined Pollack on the air at CSTV/CBS College Sports at least once, will also be part of the ESPN team. Both are television naturals, and could do do stand-up together as well as Aboott and Costello or Laurel and Hardy. 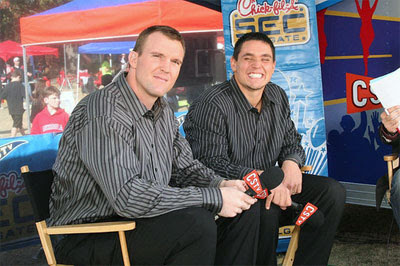 Two of a Kind: Matt Stinchcomb, left, and David Pollack have a natural on-air chemistry that will move from CBS College Sports to ESPNU this fall. Photograph Copyright 2007-2009 by Eye on Sports Media/ The Cayuga Group, LLC. All Rights Reserved. getting makeup Hollywood style before a show. The Cayuga Group, LLC. All Rights Reserved.